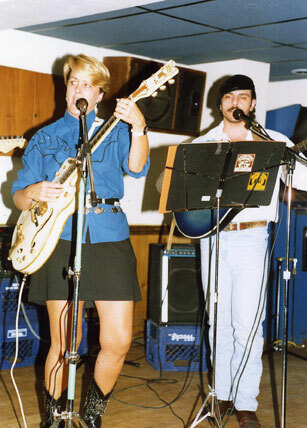 I had been playing guitar and singing in a country band with four ambitious musicians for a couple of years. We did a country jam every Tuesday night at the Rynborn in Antrim. That was a fun gig. Luther “Guitar Junior” Johnson came by and sat in. He was always very encouraging about my music. 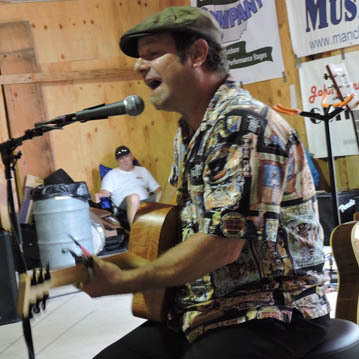 After a while playing together, we entered a New Hampshire Country Music Association Talent Contest with two original songs written by our lead guitar player, John Mavergeorge, and we got into the finals. Mike, his brother and I were singing back-up so I had very little responsibility, beyond looking good, which I tried to do. I was wearing a long black shirt covered with horses and a miniskirt. I was doing my part, make-up, the whole magilla. We had rehearsed these songs many times. I remember the day we were slated to perform in the finals. A bunch of our friends came to cheer us on at Club Decadence in Manchester, NH, including my great friend Rick Zund, who has always supported me in my efforts. I was not playing guitar on this gig so I really had it easy, but I was as nervous as a cat on a hot tin roof. The place was huge and had a big stage with flood lights, the whole thing. We were called up to the stage. Everything was looking good. We did the first song. Cool. You only get 10 minutes and they time you. So when we started on the second song, John (who wrote the song) had a really bad memory, so he put the words of the song on the floor at his feet. Sure enough, 20 seconds into the second song he forgot the words and had to look down to check them. He couldn’t see the paper for some reason, so he bent down to pull it closer to him. As he stood back up he hit the microphone with the neck of his guitar, and it flew off the mic stand. He had to catch the mic (which was headed into the judges’ table) but it banged on his guitar, and essentially the contest was over for us. I have to say, in all fairness, they were two really good songs, but I am glad it was John who bungled the gig because if it had been me or Mike he would have killed us! We got a certificate for entering. I still have it. Call me sentimental. It took those couple of years of doing the jam at the Rynborn and that competition to really teach me how demanding playing in a band can be. The rehearsing, carrying equipment, driving to and from the gig. 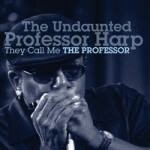 So I understand the hard work it takes to be a professional musician (to a certain degree). But what I really understand is the unmitigated thrill of a tune well done, the rush, the feeling of elation and satisfaction… the joy. Music is the best thing humans do. I am also graphic designer by trade and I was working from an office in Peterborough. I had a nice gig doing design work for a bank in Peterborough at the time (1990). The woman I worked with told me that there was going to be a recession. I decided that I needed to get something going that would be mine, that no one could take away from me, because freelance work was going to be harder to come by and there would be so much competition for it. So I decided to start the newsletter. I based the advertising layout on the Chamber of Commerce newsletter I had been producing for many years for the CC of Peterborough, NH. I had already gotten hip to the MacIntosh computer and the work was so much easier I could do it myself! 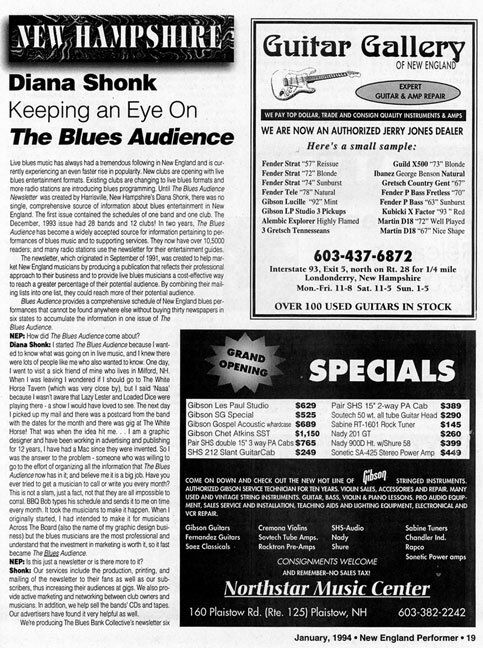 All the typesetting and design was done in the computer and at that time there were no scanners, but I had been doing graphic design “the old way” for 10 years, so I combined both skills and my love of blues and the musicians (most of whom were my friends) into the first black and white newsletter. 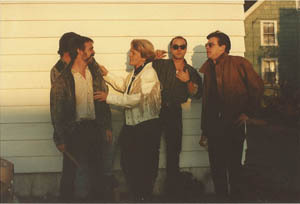 I really started it to help bands like my brother, Peter’s band, Loaded Dice. They were trying to get a postcard out in the mail to their mailing list. But it is a time consuming job to sit and write all the names and addresses on the postcards, the whole process was very arduous back then. I thought that if I did all the work that maybe the bands would pay me the money they were spending on postage (and time has a value) and I would pool all their information and send it out in one publication, professionally produced, printed and mailed in a timely fashion. I was hoping to get subscribers to help pay for the process. In the beginning I mailed it to the bands’ mailing lists, we started out with over 3,000 people mailed. I had the idea long before 1991. 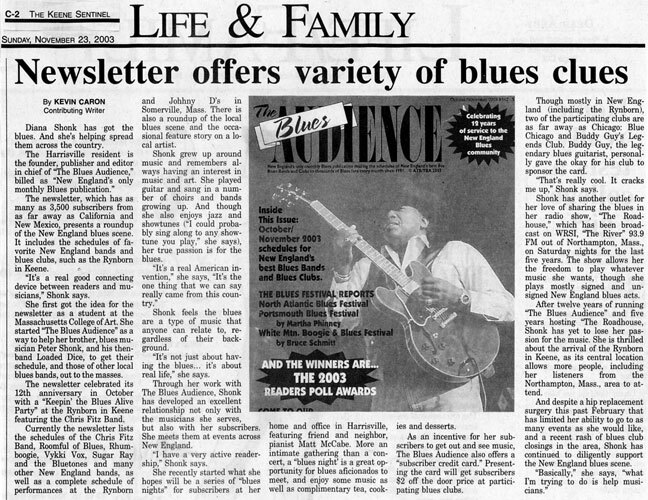 In 1978 I was living in Boston, working at legendary blues club The Speakeasy in Cambridge, MA, when I got the idea to do a newsletter that would inform all the people who love Blues about where the Blues bands were playing. I was a senior at Massachusetts College of Art when I proposed the idea for my senior thesis. They turned me down because it was “not altruistic enough.” Well, they were wrong. This newsletter has helped lots of people and causes. 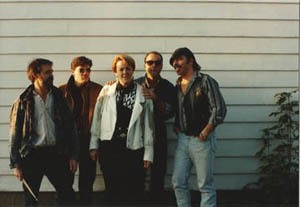 In 1991 I got my brother’s band Loaded Dice, The Movers, The Rynborn and a few other New England area bands and businesses to support it and off we took. The first two or three years I helped pay for it with my graphic design business, but then it started to hold its own. I called it “Audience.” It was Rockin’ Jake that mentioned that it should be The Blues Audience (T.B.A.) at the Portsmouth Blues Festival the next summer. What a great idea! The early newsletters were crude compared to today’s four color version. We had a number of difficult quality control moments in the early years. Now I can control everything from right here at my computer, a powerful Mac. Producing a newsletter every month was a lot of work and it meant I had to schedule my life and other work around it. I went to as many live shows as I could and I was younger and could handle the traveling and getting home at 2:30am. After a few years I moved the office up to my house, and it took over the whole place. (My house is very small). Susie Gordon, Luther Gtr. Jr. Johnson’s live-in girlfriend at the time, wanted to move back to NH, so I hired her to work for the newsletter. That was when it really took off. She knew lots of musicians I did not know. She was a tremendous help for 3 years! It was way too crowded in my house, so I applied for a loan, and, with the help of a keyboard player/business graduate named Jeremy Brown, put together the business plan required by the bank for an addition. Then I built the garage with a studio above and moved in up here in 1994. Two Blues lovers built it, a Blues musician put up the drywall, a Bluegrass musician put on the garage doors and a Blues musician and stone mason did the brick and stone work. 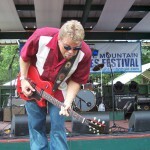 It has been an amazing trip, these past 20 years working with the New England Blues scene. I have seen so many bands, so much talent. We are very lucky here in N.E. to have such a great scene. It has had its ups and downs, and we may be in a down cycle right now, but I’ve seen it all before, things will get better for the musicians and clubs, nothing stays the same. The newsletter has a life and a legacy of its own. 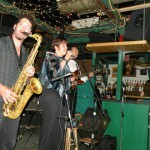 We will continue to have clubs and venues share their stages with this great music. But things change, clubs close, bands change, and sadly musicians die. The newsletter has become a bi-monthly to save money for the musicians and to give me a life in between (well mostly because I had my hip replaced and I couldn’t get up the stairs to do the February issue so I started to do it every other month). And the result has been very successful. It has made the newsletter more affordable for any band, because I did not raise the rates over the years, in fact, I have lowered them. One thing I see as a constant is that people LOVE this music. It is very personal and satisfying. Our musicians bring heartfelt emotion to their craft. Don’t forget they are expressing deeply felt ideas while playing instruments and that take years of work and dedication to learn to play so fluidly. They love what they do, and so do we. I have tried to help promote their events and I do not intend to give that up anytime soon. 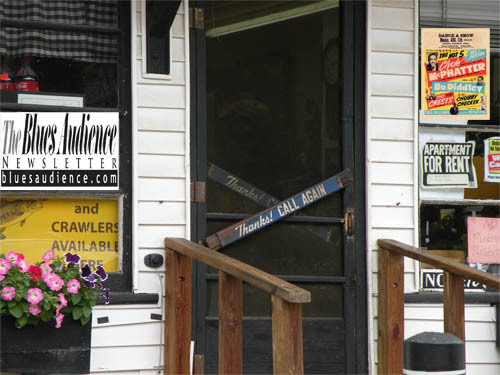 We have had a tremendous time doing the Blues Audience Parties in support of bands at clubs all over New England. We have supported the Festivals. The web site has been up for about 11 years and just recently I overhauled it so we can take subscriptions online!! (I will never forget my first online subscriber, Laurie Holiman. I was so surprised and delighted when she subscribed 2 days after I got the Paypal system set up!) I am thankful for the support you, subscribers, have given me over the years. I have seen many publications come and go over the years. 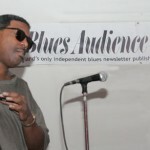 Now apparently The Blues Audience is the only Blues newsletter in publication currently in New England. But if the musicians keep playing the Blues and the crowds keep loving to see live Blues, The Blues Audience will be there to support the scene. We spell Blues it a capital B! 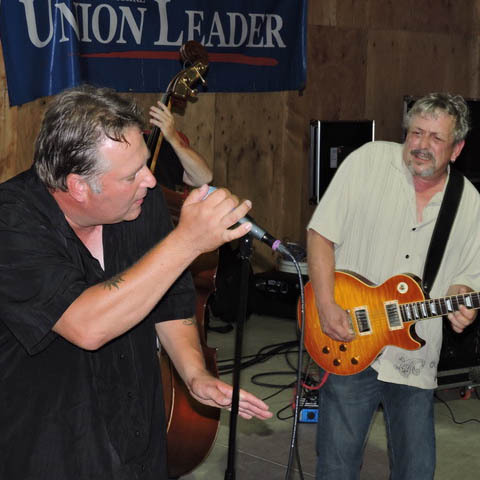 AND the coolest New England Blues Festivals! There are many special events in every issue.